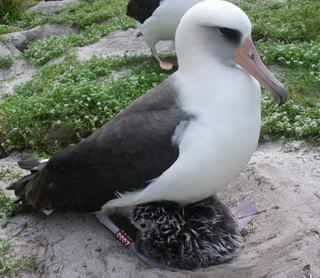 The oldest known U.S. wild bird, a 60 year-old Laysan albatross named Wisdom, is a new mother. The bird, which has likely logged 50,000 miles per year in flight as an adult, returned to Midway Atoll to nest and was spotted a few weeks ago with a new chick by a U.S. Fish and Wildlife Service biologist. The bird has worn out 5 bird bands since she was first banded by U.S. Geological Survey scientist Chandler Robbins in 1956 while incubating an egg. Chandler named her Wisdon and rediscovered her 45 years later in 2001. 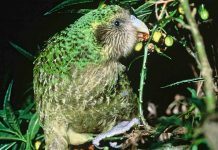 In 1956, he estimated Wisdom to be at least 5 years old (the earliest age at which these birds breed) though they more typically breed at 8 or 9 after an involved courtship lasting several years. There must be something to all that fish oil she consumes because Wisdom does not look her age (photo, above). Wisdom, Peterjohn said, has likely raised at least 30 to 35 chicks during her breeding life, though the number may well be higher because experienced parents tend to be better parents than younger breeders. Albatross lay only one egg a year, but it takes much of a year to incubate and raise the chick. After years in which they have successfully raised and fledged a chick, the parents may take the occasional next year off from parenting. Klavitter said that Wisdom also nested in 2006, 2008, 2009 and 2010. And since adult albatross mate for life, with both parents raising the young, it makes one wonder if Wisdom has had the same partner all these years or not. Almost as amazing as being a parent at 60 is the number of miles this bird has flown — at least 2 to 3 million miles since she was first banded. Or, to put it another way, that’s 4 to 6 trips from the Earth to the Moon and back again with plenty of miles to spare. One reason for all these miles is that Laysan albatross spend the first 3 to 5 years after fledging at sea, never touching land. Then they return to breed in the northwestern Hawaiian Island chain although some of their feeding grounds are off the coast of western North America, including the Gulf of Alaska. In the non-breeding part of the year, the albatross remains in flight –and scientists believe, often even sleeps while flying over the ocean. In addition to establishing longevity records, bird banding data documents migratory patterns, provides critical harvest and survival information used to manage populations of migratory game birds, and supports research activities on many issues from toxicology to disease transmission and behavior. Since 1920, approximately 64.5 million birds have been banded by this Interior Department-Canadian Wildlife Service program, and of those, nearly 4.5 million bands have been recovered. I loved this story – thank you for bringing me a lift today.